Prepare for tea was a real treat for the sweet tooth. Aromatic and delicious pie with raisins and rice is a great Breakfast for the whole family. Its pretty quick and easy to prepare. - 1 tsp of salt. - 1 tsp of sugar. Melt the margarine, mix it with sour cream and flour. Knead the dough and leave in the fridge for 60 minutes. Prepare a delicious stuffing. Thoroughly wash the rice and boil it in milk with water. Wash the raisins, pour it with hot water. Put it to the rice when it is cooked. Then put back the sugar, salt and vanilla sugar. Let the mass cool slightly and add eggs. Mix everything carefully. Gently roll the dough in a rectangular layer, in the form it should slightly exceed the size of the pan. Piece, make a small bumpers. They are needed, so that the filling does not touch the walls of the pan. Pre-grease a baking sheet with vegetable oil. Over the dough place the rice, gently spread it over the entire surface. Preheat the oven to 180 ° C, bake the pie for approximately 45 minutes. Then remove from the oven. Cut into small pieces and serve. Prepare the dough for baking. In a bowl mix yogurt, sour cream, butter. Then add eggs and flour, season with salt. Mix everything carefully. Prepare the stuffing. Boil the rice until soft and cool. Prunes, apricots and raisins rinse well. Then in a separate bowl, mix the rice with dried fruit, add the sugar, butter and salt. Roll out the dough into one oblong formation. Put on one side of the filling and on top, gently cover with the second part. Put the pie on a baking sheet (grease it with vegetable oil), on top of your request may sprinkle with sugar. Preheat the oven to 180 ° C, bake for 50 minutes. Delicious pie with rice, raisins and dried apricots ready. In a small bowl, whisk the eggs with the sugar. Put them rice and fresh cheese. Pre-boil the rice. Then add sour cream, flour, cranberries and raisins. Mix everything carefully. You should get a thick batter. The form for baking grease with vegetable oil, put there the prepared mixture, sprinkle with semolina. Preheat oven to 190оС. Bake the pie for approximately 50 minutes. Readiness check cake with a toothpick. Gently make a few punctures. It should remain dry. 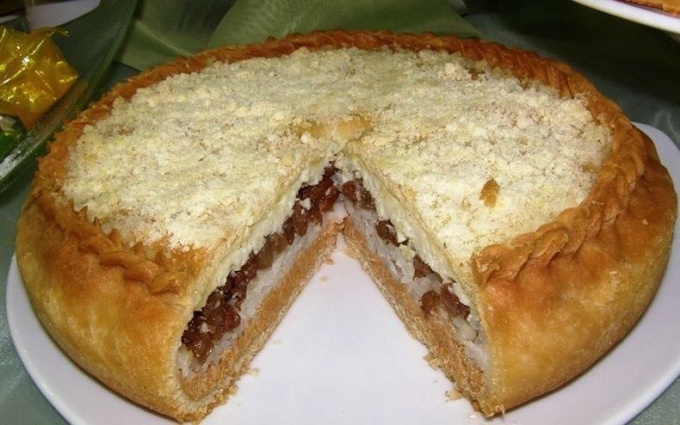 Pie with rice, raisins and cottage cheese serve with your favorite jam. To prepare this cake according to your wish you can use any berries.